In 2016, the US Department of Labor reported close to 2.9 million workplace injuries. Most of these injuries could have been prevented if work equipment were properly used. As a truck lift beginner, it is important to know how to keep yourself safe while using a truck lift. Continue reading to learn some safety tips to follow in your workplace. There many varieties of lift gates. Each comes with its own specific manual and its own set of hazards. Locate all safety decals and follow the directions. Take note of the weight of your freight and your truck lift’s capacity. If you are the one purchasing the lift gate, overbuy for capacity so you have a good margin. Prior to operating your truck lift, check the equipment for any signs of damage. Do not use if there are any signs of abuse. If the lift gate does need maintenance, do not perform on your own. Take it to a garage to get it serviced. Also, ensure your lift gate has proper clearance to operate and that the area is clear of obstacles. 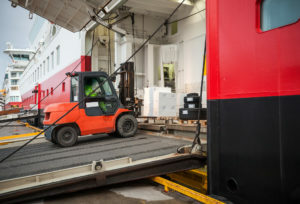 It is important to only use the lift gate to lift or lower cargo from the truck. Do not use it as a personnel lift. Set the truck’s brakes and try to operate the lift gate on a level surface. To prevent the freight from tipping or rolling off, do not overload and secure heavy loads. If your cargo tips or rolls, always try to move out of the way safely. Never sacrifice yourself for freight. Consider the safety of others and alert bystanders to keep their distance while lowering the lift and unloading the freight. Do not drive with the lift gate down. Always stow the platform when not in use. Keep body parts clear of all pinch points. A pinch point is anywhere a person could get caught within the moving parts of a machine. Hands and feet are particularly vulnerable during the lowering and raising of the lift gate. Also, never enter the area beneath a raised lift to further prevent accidents. As a beginner, you will have questions. Ask for assistance from well-trained co-workers or your employer. This goes for loading and unloading freight as well. Do not attempt to load or unload something beyond your ability. Taking the proper precautions while operating a truck lift gate will prevent accidents, injuries, and even fatalities. These tips can be applied when using other lift products as well. Is your business in the market for a new lift or customized lift gate? Check us out at Lange Lift. We have been manufacturing high-quality lifts since 1934, and we promise exceptional functionality and longevity with all of our products.